The UB8 Satellite antenna is designed to be used with GOES, Meteosat & GMS satellite transmitters and receivers. Typical application is the GOES DCS at 402 MHz transmit. Its 8.4 dB gain allows the maximum EIRP of 48 dBm on the GOES HDR signal to be obtained with 12 watt transmitters allowing for 1 dB cable loss. One of the outstanding characteristics of the UB8 is its low profile rugged design. It is easily mounted either external or internal to sensor shelters. The construction includes all stainless steel integral mounting hardware that incorporates mounting for the GPS antenna, which simplifies site hardware. The radome cover material is UV and salt water resistant and readily sheds snow and rain. The UB8 is not affected by rain, snow, or freezing rain. An optional hydrophobic coating further improves water shedding. A variety of colors are available, consult factory. The wide band matching and integral ground plane prevent the antenna from being detuned by nearby objects unlike narrow band antennas. All exposed metal is marine grade stainless steel providing excellent corrosion resistance. The radome is extruded UV resistant 1/8-inch ABS plastic. 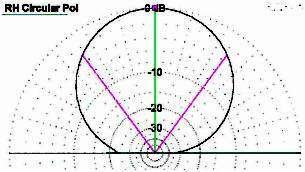 The antenna radiation pattern below is a simulation over an infinite, perfect ground plane.